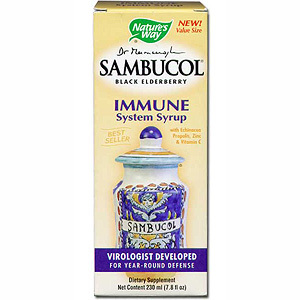 Sambucol Immune System Syrup Liquid Elderberry, Echinacea, Propolis, Zinc & Vitamin C Great Tasting Liquid, Virologist Developed, Clinically Tested Elderberry Extract Developed by world renowned virologist Dr. Madeleine Mumcuoglu, Sambucol Immune System formula is specially prepared to support an adult’s immune system. It was Dr. Mumcuoglu that discovered the key active ingredient in elderberry, then patented a procedure for its correct standardization. Laboratory and clinically tested, Sambucol black elderberry extract has been used by millions of people, with positive results being reported worldwide. No other elderberry product can make the same claim. Sambucol Immune System formula combines Dr. Madeleine Mumcuoglu’s original black elderberry extract with echinacea, propolis, vitamin C and zinc, all well documented for their health promoting benefits. Kosher: Under supervision of the Chief Rabbinate of Jerusalem, Israel. This entry was posted on Tuesday, February 28th, 2006 at 9:59 am and is filed under Herbal Supplements. You can follow any responses to this entry through the RSS 2.0 feed. You can leave a response, or trackback from your own site.